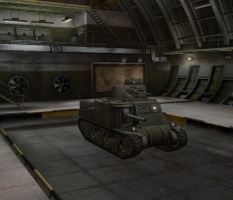 The M3 Lee is an American tier 4 medium tank. Un carro medio de los EE. UU. de la era de la II GM. El vehículo recibió su nombre en honor del general confederado de la Guerra Civil de los EE. UU. R. Lee. Además, muy conocido por su designación en el R.U. (M3 Grant) en honor del general de las tropas federales U. Grant. El M3 fue creado en 1940 sobre la base del carro M2, y entró en la producción en masa desde junio de 1941 hasta diciembre de 1942. Se fabricaron un total de 6258 carros M3 en varias modificaciones. Unfortunately for some players, this tank may be somewhat difficult to play with, particularly if you're less experienced with Tank Destroyers. The M3 Lee's gun is not mounted on a turret and as such, it plays similarly to a tank destroyer. However, it is not an effective sniper because its guns are implemented with mediocre accuracy, and its large size requires good camouflage to remain hidden when firing, which, from a single bush, will probably not be available. Additionally, the top turret (historical 37mm) sticks out of short cover and is usually fired on. Its frontal armour can also be penetrated easily, thereby putting the driver in constant danger of injury and greatly hindering survivability in a fair fight. The M3 Lee leads to the M4 Sherman, and the T1 Heavy Tank. Main gun is mounted in the hull; getting tracked is a severe liability . Due to the top turret, this tank's camo rating is poor. The Lee is widely considered to be very weak for a tier IV medium; it's hard to use and needs more time than will be used to grind the following tanks to get used to due to being very unusual for its class. One of the good things is the gun's damage but it comes with a stock cannon that will embarrass a tier 1 tank. It will seldom allow you to penetrate any tanks at its tier or above. The upgraded gun has an improved rate of fire, better accuracy (but still very bad), decent damage but severely neglected in penetration, but it can quickly decimate lower tier tanks should the Lee be able to hit the target. Although the guns are mediocre, the faults outweigh the pros for all players. A Lee in a hidden position or flanking can emit decent amounts of damage within a fairly short period of time, since the very fast rate of fire of 20rpm gives it 2200 DPM (however the penetration, accuracy and aiming time will make this unreliable to do). This completely unreliable amount of DPM is somehow the highest DPM of any tank in tier I-V, and can even rival a fully upgraded Ferdinand. However, though the DPM is high is it should never be relied on, as you have to hit and penetrate your target to have reliable DPM; the M3 is good at neither. This tank should be played like a tank destroyer. The T40 shares many characteristics with the M3 Lee (engine power, top speed, hull armour and signal range), whilst the M3 Lee has better HP. 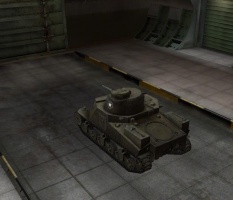 However, the T40 has better camo values and a more accurate and harder hitting gun. If you keep in mind that the stealth characteristics are somewhat worse and the profile bigger, it is extremely rare to be even slightly successful with this tank. The M3 Lee is considered "cannon fodder" by most, if not all players. It possesses a top gun dissimilar (regarding soft stats) to the AT M1A1 gun found on the T67. Most tankers put a priority on "easy kills", and the M3 Lee is one of the tanks on the list. 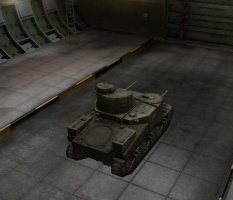 Tier three tanks will not have trouble penetrating the armour if they know where to aim. Even the MS-1 is capable of penetrating your tank under certain circumstances. Unless the Lee plans on flanking the enemy team, try to place yourself behind your teammates where you can shoot at the enemies, but not get shot back. If a hostile tank is seen who might be flanking your position, MOVE! 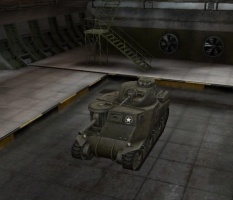 An interesting aspect of the M3 Lee is that its gun is mounted on a sponson on the right side of the tank. If you hide on the left side of a corner, it is possible to hide almost all of your front profile from the opponent without worry. Conversely, the right-mounted sponson means that making a right turn will require you to show your full frontal profile before being able to bring your gun to bear. This is supposed to be in compensation for being a poor tank. A useful rule of thumb is to always hide on the right side of a building, so as to conceal most of your (Relatively poorly-armoured) front. Try to find a different spot with cover, where you can park your tank with only the gun itself poking out from behind the wall, rock, etc. However you will likely be spotted. Overall, this is the worst tank in the history of WOT. The AMX 40, also considered to have this title, has brilliant armour and therefore forfeits the role to the M3 lee. This tank's gun is nonexistent, and is its turret and traverse arc shares the same fate. 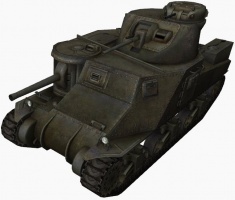 This tank is just a persuasion to get people to use 30K free experience on the M4 and T1 heavy. It is a true insult to Lee. The radios come from the M2 Medium Tank so mount the SCR 506 right away. Finally research the suspension, or you can just grind onto the next tank. 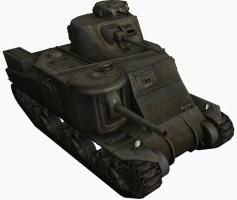 The Medium Tank M3 was an American tank used during World War II. In Britain the tank was called "General Lee", named after Confederate General Robert E. Lee, and the modified version built with a new turret was called the "General Grant", named after U.S. General Ulysses S. Grant. Design commenced in July 1940, and the first "Lees" were operational in late 1941. 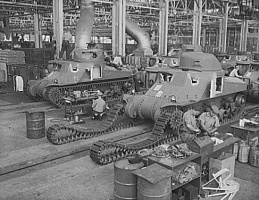 The U.S. Army needed a good tank and coupled with Great Britain's demand for 3,650 medium tanks immediately, the Lee began production by late 1940. 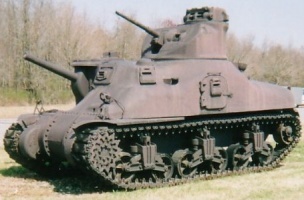 The M3 was well armed and armored for the period, but due to design flaws (high silhouette, archaic sponson mounting of the main gun, below average off-road performance) it was not satisfactory and was withdrawn from front line duty as soon as the M4 Sherman became available in large numbers. Chrysler tank arsenal. Workers in the huge tank Chrysler arsenal near Detroit, putting the tracks on one of the giant M-3 tanks. In 1939, the U.S. Army possessed approximately 400 tanks, mostly M2 light tanks, with less than a hundred of the discontinued M2 medium tanks. 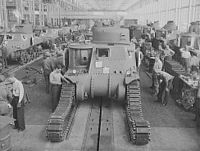 The U.S. funded tank development poorly during the interwar years, and had no infrastructure for production, little experience in design, and poor doctrine to guide design efforts. 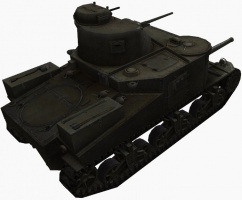 The M2 series medium tank was typical of AFVs many nations produced in 1939. When the U.S. entered the war, the M2 design was obsolete with a 37 mm gun, 32 mm frontal armor, machine gun main armament, and a very-high silhouette. The Panzer III and Panzer IV's success in the French campaign led the U.S. Army to immediately order a new medium tank armed with a 75 mm gun in a turret. This would be the M4 Sherman. However, until the Sherman was in production, an interim design with a 75 mm gun was urgently needed. The M3 was the solution. The design was unusual because the main weapon; a larger caliber, low-velocity 75 mm gun, was in an offset sponson mounted in the hull with limited traverse. A small turret with a lighter, high-velocity 37 mm gun sat on the tall hull. A small cupola on top of the turret held a machine gun. The use of two main guns was seen on the French Char B, the Soviet T-35, and the Mark I version of the British Churchill tank. In each case, two weapons were mounted to give the tanks adequate capability in firing both anti-personnel high explosive ammunition and armor-piercing ammunition for anti-tank combat. 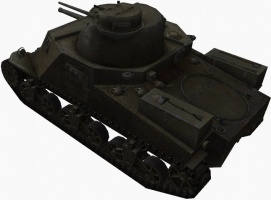 The M3 differed slightly from this pattern having a main gun which could fire an armor-piercing projectile at a velocity high enough for efficiently piercing armor, as well as deliver a high-explosive shell that was large enough to be effective. Using a hull-mounted gun, the M3 design was produced quicker than if a turret mount gun had been manufactured. It was understood that the M3's design was flawed, but Britain urgently needed tanks. The M3 was tall and roomy: the power transmission ran through the crew compartment under the turret cage to the gearbox driving the front sprockets. Steering was by differential braking, with a turning circle of 37 ft (11 m). The vertical volute suspension units included a return roller made with self-contained and readily replaced units bolted to the chassis. The turret was power-traversed by an electro-hydraulic system: an electric motor providing the pressure for the hydraulic motor. This rotated the turret fully in 15 seconds. Control was from a spade grip on the gun. The same motor provided pressure for the gun stabilizing system. 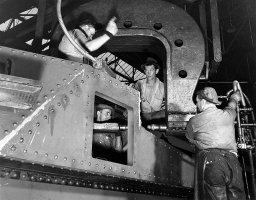 The 75-mm was operated by a gunner and a loader. Sighting the 75-mm gun used an M1 periscope, with an integral telescope, on the top of the sponson. The periscope rotated with the gun. The sight was marked from zero to 3,000 yd (2,700 m) with vertical markings to aid deflection shooting at a moving target. The gunner laid the gun on target through geared handwheels for traverse and elevation. The 37-mm was aimed through the M2 periscope, though this was mounted in the mantlet to the side of the gun. It also sighted the coaxial machine gun. Two range scales were provided: 0-1,500 yd (1,400 m) for the 37-mm and 0-1,000 yd (910 m) for the machine gun. The British ordered the M3 when they were refused permission to have their tank designs (the Matilda infantry tank and Crusader cruiser tank) made by American factories. British experts had viewed the mock-up in 1940 and identified several flaws; the high profile, the hull-mounted gun, radio in the hull, smooth tracks, and the amount of armor with insufficient attention to splash-proofing the joints. The British agreed to order 1,250 M3s, to be modified to their requirements. The order was subsequently increased with the expectation that when a superior tank was available it, could replace part of the order. Contracts were arranged with three U.S. companies, but the total cost was approximately 240 million US dollars. This sum was all of the British funds in the US and it took the Lend-Lease act to solve the financial problems. The prototype was completed in March 1941 and production models followed with the first British specification tanks in July. The British cast turret included a bustle at the back for the Wireless Set No. 19 radio. It had thicker armor than the U.S. one and removed the U.S. cupola for a simple hatch. Both U.S. and British tanks had thicker armor than first planned. The British design required one fewer crew member than the US version due to the radio in the turret. The U.S. eventually eliminated the full-time radio operator, assigning the task to the driver. The British realized that to meet their requirement for tanks, both types would be needed. The U.S. military utilized the "M" (Model) letter to designate nearly all of their equipment. When the British Army received their new M3 medium tanks from the US, confusion immediately set in, as the M3 medium tank and the M3 light tank were identically named. The British army began naming their American tanks, although the U.S. Army never used those terms until after the war. 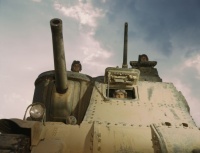 The M3 tanks with the new turret and radio setup received the name "General Grant", while the original M3s were called "General Lee", or more usually just "Grant" and "Lee". The M3 brought much-needed firepower to British forces in the African desert campaign. 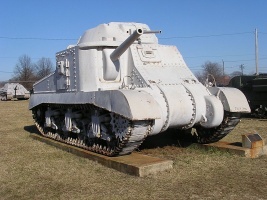 The chassis and running gear of the M3 design was adapted by the Canadians for their Ram tank. The hull of the M3 was also used for self-propelled artillery and recovery vehicles. Of the 6,258 M3s produced by the U.S., 2,855 M3s were supplied to the British army, and about 1,368 to the Soviet Union. Consequently, one of the American M3 medium tank's first actions during the war was in 1942, during the North African Campaign. British Lees and Grants were in action against Rommel's forces at the disastrous Battle of Gazala on 27 May that year. They continued to serve in North Africa until the end of that campaign. A regiment of M3 Mediums was also used by the U.S. 1st Armored Division in North Africa. In the North African campaign, the M3 was generally appreciated for it's mechanical reliability, good armor, and heavy firepower. In all three areas, it outclassed the available British tanks and was able to fight German tanks and towed anti-tank guns. The tall silhouette and low, hull-mounted 75-mm were severe tactical drawbacks, since they prevented the tank from fighting from hull-down firing positions. 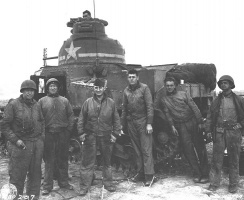 The use of riveted armor led to a problem called "spalling," whereby the impact of enemy shells would cause the rivets to break off and become projectiles inside the tank. Later models were welded to eliminate this problem. 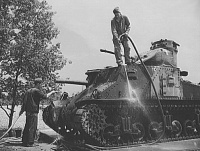 The M3 was replaced by the M4 Sherman as soon as these were available, though several M3s saw limited action in the battle for Normandy as armored recovery vehicles with dummy guns. Over 1,300 diesel-engined M3A3 and M3A5s were supplied to the USSR via lend-lease in 1942-1943. All were the Lee variants, although they are sometimes referred to generically as Grants. The M3 was unpopular in the Red Army, where it's faults were shown up in engagements with enemy armor and anti-tank weapons, with the Soviets bestowing it the nickname of "coffin for seven brothers." Few were seen in combat after about mid-1943, though some M3s were used on the Arctic Front in the Red Army's offensive on the Litsa front towards Kirkenes in October 1944. The Germans had, on this front, only a relatively-few obsolete French Hotchkiss tanks that they had acquired during their occupation, consequently the M3's inferior tank-to-tank capabilities were of limited importance. M3 Lee medium tank, Fort Knox. Maintenance of mechanized equipment. The Pacific War was an ocean war fought primarily by the naval fleets of the U.S. and the Empire of Japan. Tank warfare would play a secondary role, the primary battles being between warships. Within the Pacific Theater of Operations (PTO), the U.S. Marine Corps deployed all six of it's tank battalions; the U.S. Army deployed only a third of it's 70 separate tank battalions, and none of it's armored divisions, in the Pacific. During the battle for Tarawa island in 1943, the U.S. Army attacked nearby Makin Island, which was considered a less-,costly operation. The army was supported by a platoon of M3A5 Lee medium tanks from the U.S. Army's 193rd Tank Battalion, making this battle the only U.S. Army combat use of the M3 in the Pacific Theater. No M3s were supplied to the U.S. Marine Corps. When the British received their new M4 Shermans from America, it quickly transferred approximately 1,700 M3s to the China-Burma-India (CBI) theater, deploying about 800 M3s to Australian forces and about 900 M3 tanks to Indian forces. British Lees and Grants were used by the British Fourteenth Army from the fall of Rangoon, performing admirably until the end of the war. In the Far East, the M3's main task was infantry support. It played a pivotal role during the Battle of Imphal, during which the Imperial Japanese Army's 14th Tank Regiment (consisting of mostly captured British M3 Stuart light tanks and their own Type 95 light tanks) encountered M3 medium tanks for the first time. Despite their lower-than-average off-road performance, the M3s performed well as they traversed the steep hillsides around Imphal. Declared obsolete in April 1944, the General Lee fought on against Japan until the end of the war. In the end, the M3 in the CBI theater performed the mission it's original designers had intended it to do: that of supporting the infantry. Overall, the M3 was able to cope with the battlefield of 1942. It's armor and firepower were the equal or superior to most of the threats it faced. Long-range, high velocity guns were not yet common on German tanks. However, the rapid pace of tank development meant that the M3 was very quickly outclassed. By mid-1943, with the introduction of the German Panthers andTigers, the up-gunning of the Panzer IV to a long 75-mm gun, and the availability of large numbers of Shermans, the M3 was withdrawn from service in the European Theater. 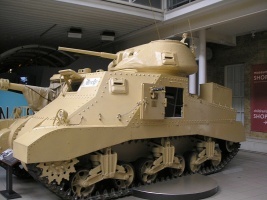 A Grant Command variant used by General Montgomery housed at the Imperial War Museum in London. Esta página fue modificada por última vez el 25 oct 2016, a las 12:56.